Hi! My name is Lucas and I’m a hobbyist gamedev using GameMaker Studio 2 (GMS2). This is a tutorial on how to create a script for nine slice scaling in GMS. I have an example project in my itch.io page that can be download for free and shows how the script works, also if you want to support me, you can purchase the script. Example Project available for free at my itch.io page. The four corners remain the same, while the other parts are stretched vertically/horizontally to fit the desired size. Obviously this can be a very useful tool when creating a game. One of the limitations of this script is that the width and height of all slices must be the same. We are going to choose the place and size of the panel and also if we are going to stretch the middle parts or tile them. And it is actually a very simple script, all we are going to do is draw each of the slices in the correct place, but first we need to import the sprites in GMS2 in the correct manner. The nine slices must be imported into GMS2 as a single sprite resource, but each one of them as a different frame, following the order: top left, top center, top right, middle left, middle center, middle left, bottom right, bottom center and bottom left. And the origion of the sprites must be the top left corner (0, 0), which is the default. An important thing to remember is that the first frame (subimg) of a sprite in GMS2 is always 0. But as mentioned above we will also have the option to tile the center slices instead of stretching them. 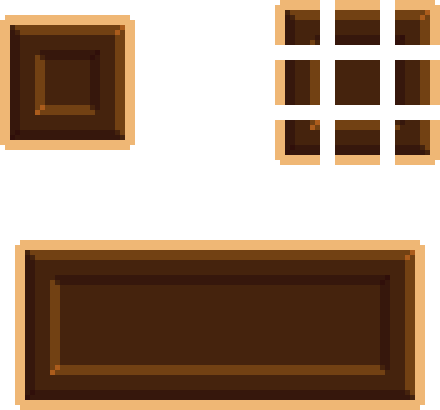 For that we have to set the width of the panel to be a multiple of the sprite width, the same goes for the height. Left: stretched sprite. 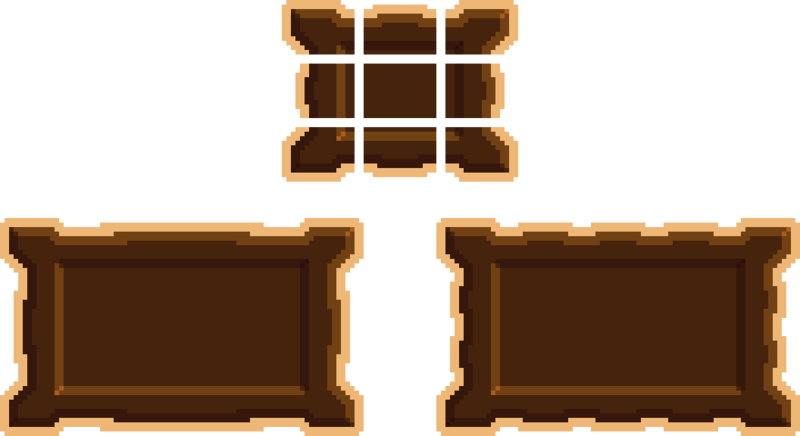 / Right: Tiled sprite. If the panel width provided is 95 and the sprite width is 10, this code will add 5 to the total width. Following that, it’s then calculated the number of times the center slices have to be repeated to complete the panel ( _tileWidth and _tileHeight). Now we can actually start drawing the slices. I’m not going to explain each one of the slices in detail, but basically if the panel is stretched we are just calculating the x and y and the distance that the slice is going to be stretched over. If the panel is tiled we use a for loop to draw the same slice repeatedly in the correct place. Thanks to Michael Cazzarolli, who left a comment below, we have a greatly optimized version of the script, putting a bunch of IFs and FORs together. So, this is the entire script. Pretty simple, right? If you have any questions feel free to contact me at my Twitter or Itch.io page. If you’re interested in more tutorials I have another about creating a Random Maze Generator. Check it out!